TITLE: Tragedy Strikes At Western Union! will be of mutual benefit to the two of us. of my clients extended relatives, this has also proved successful. bank where this huge deposits were lodged. documentations and the documents are with me. to you,while 5% should be for expenses,tax as your government may require. Please get in touch with me by return email . for easy communication in this mutual transaction. OK I have to explain a few things here. I have had to exclude a few days of correspondence for security purposes. The reason for the self censorship is that the techniques used in this particular scambait need to be kept out of the way of prying eyes (scammers will be watching!). The routine is similar to the one that I used in the Frank Kabongo bait, Scamming On The Telephone but with newer more 'convincing' operations added. The technique uses some new ideas from myself, and also ideas that other fellow baiters are using. To openly publish this particular correspondence in full would jeopardize both myself and my fellow scambaiter's future efforts against these people. Of course the art of scambaiting can be very humorous, but at the same time it is a very serious business, and we do not want to educate these thieves in our various tactics. Apologies to my readers, but the full correspondence will be published when it's safe to do so! We take up the story a few days later. I have convinced Martins that I have already sent money to another scammer. Martins thinks that I have contacted him by mistake, thinking he is my original scammer, but soon he is in for a big let-down. In the process, Martins is made to change his name from Martins Jide to Martins Jude (he thinks this is the name of my original scammer). He believes I have $77,250 to transfer to him, but before he receives that there is the small matter of my guarantee fee! Martins calls me to try to convince me to put my money into a fake online bank. Subject: SENDING YOU THE $500. GUARANTEE FEE. REAGRDS TO OUR TELECONVERSATION, DO SEND IMMEDIATLY THE NAME WITH WHICH YOU WILL RECEIVE THE $500 USD. BY WESTERN UNION. THIS IS ACCORDING TO OUR AGREEDMENT REACHED UPON EVERY OR BEFIRE ANY PAYMENT YOU WILL MAKE. HOWEVER, I WANT TO LET YOU KNOW THAT IT IS WITH MY GREATEST ENTHUSIAISM THAT I WANT THIS TRANSACTION TO BE CONCLUDED AS SOON AS POSSIBLE. What day will you be sending the payment? If you are sending it BEFORE Thursday then I will have to send my secretary David XXXXX to pick the money up. So, send the W.U. payment in the name of David XXXXX. Let me have a fax/scan of the payment receipt and also any other information which may be required. When my secretary returns with the payment I shall then forward the full outstanding fee to you immediately. Subject: Re: SENDING YOU THE $500. GUARANTEE FEE. AS SOON AS IT IS SENT I SHALL NOTIFY YOU. THE $500 USD. AGREEMENT FEE HAS BEEN SENT TO YOU. AMOUNT: 400 POUNDS. (THIS WAS SO BECAUSE IF CONVERTED TO UNITED STATES DOLLARS, IT WILL AMOUNT OT $500. USD. OR MORE. THIS WAS ACCORDING TO OUR AGREEMENT, SINCE THE TRANSACTION IS IN DOLLARS. HOWEVER, AS SOON AS YOU GET THE MONEY DO LET ME KNOW BY SENDING THE WESTERN UNION INFORMATION OF THE BALANCE THAT YOU WILL BE SENDING FOR THE FINAL CONCLUSION OF THE TRANSACTION. SEND THE BALANCE TO THE FOLLOWING NAMES. (SPLIT IT BETWEEN THESE TWO NAMES). HOWEVER, ALL ARRANGMENTS HAS BEEN PUT IN PLACE ASWELL FOR THE CONFIRMATION OF THE RECEIPT OF TRANSFER THAT WOULD BE SENT TO YOU, SO THAT YOU CAN ACKNOWLEDGE THE FUNDS'S TRANSFER IN YOUR BANK ACCOUNT. I am confused by the payment amounts you state below. £400 UK POUNDS is equivalent to $700 US DOLLARS. Please can you confirm the EXACT amount paid in. Western Union will NOT let me withdraw the money unless I am able to tell them the correct monetary amount. JUST COLLECT THE £400 UK POUNDS , AS STATED IN MY LAST E-MAIL. REGARDSLESS OF WHAT THE EQUIVALENT WOULD BE IN US. DOLLARS. 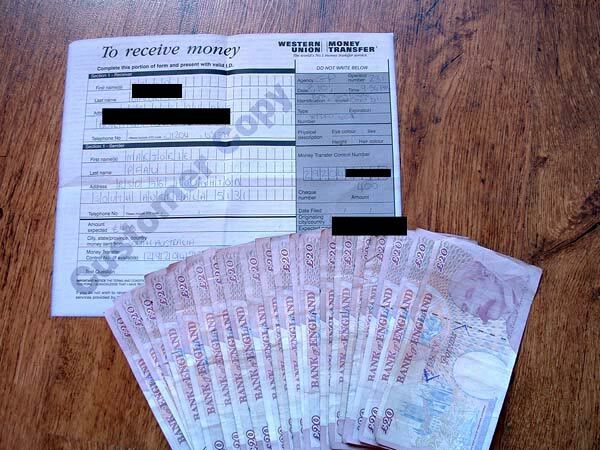 JUST FILL THE WESTERN UNION RECEIVER'S FORM TO COLLECT £400 UK POUNDS . HOWEVER, THE RECEIVERS OF THE BALANCE PAYMENT THAT YOU WOULD BE SENDING TODAY HAVE PROCEEDED TO CONFIRM THAT YOU HAVE SENT THE BALANCE; THEIR NAMES ONCE AGAIN. YOU SHOULD SPLIT THE BALANCE IN ACCORDANCE TO THE HIGHEST AMOUNT THAT COULD BE SENT BY WESTERN UNION AND AND REPLY TO THIS E-MAIL BOX WITH THE CONTROLE NUMBERS, TEST QUESTIONS AND ANSWERS; " DO NOT SEND IT BY FAX OR OTHER MEANS"
SEND IT TO THIS E-MAIL. ALL PROCEEDINGS HAVE BEEN ARRANGED TO TAKE EFFECT TODAY MONDAY. I HAVE BEEN TRYING TO CALL YOU OVER THE WEEKEND, I SHALL CALL YOU AGAIN. DO GIVE ME AN ALTERNATIVE NUMBER. The money has already been donated to a worthy charity. It has been confirmed that you have received the Guarantee Fee. by western union. I tried calling you all day but to no avail. give me your alternative number. However, the receiving officers are still waiting. According to our agreement, i have done by part, please endevour to reach me immediatly in response to this e-mail. I have made planns on my resignation to join you upon the confirmation of the funds in your Bank account. My name is Miss Knight and I am the Personal Assistant to Mr. Marcus Dewitt. Mr. DeWitt has not come into work this morning and we are urgently trying to locate him. I will ensure that he contacts you urgently as soon as we have located him. I was suprised to see a mail from Mrs. Gladys Knight. saying you that you have not been reached. On the other hand, it is also obviouse that since David XXXXX received the Gurantee fee from the western union, i have not gotten a mail from you. I do not want to Beleive that you have refused to contact or respond to my e-mails. I was also perplexed when got a message from my several dials of your number, from the operator say that your number has been disconnected and no more exists on the network. the Funds are still intact waiting to be Paid into your Bank Account. did you receive my response to your e-mail? Have you reached Mr. Marcus DeWitt? Please do let me know as it is urgent that i communicate with him. Do respond to this e-mail with a contact telephone number. Martins calls and needs to know why I haven't spoken to him recently. Note that I have edited out a couple of seconds of audio containing a few digits of my telephone number. please relay the below message to Mr. Marcus befire the hour of 2 pm. i got your e-mail and i called him on the number that you gave me. Dear Marcus, here is the names. 1. name : OKONKWO EMEKA JUDE. above are the names to which you will send the BALANCE. split the balance among the above names and send by western union. i hope this mail reaches you as i have been trying to send you a fax. respond to this e-mail and send western union information to the fax number that i gave you over the phone. please do reply to confirm the receipt. Yes, I'm afraid I'm dead dear readers! Gladys has some bad news for Martins. I am afraid it is my sad duty to inform you that Mr. DeWitt was killed in a automobile accident last Tuesday. I am sorry that you have had no contact but the office as been closed for some days a sign of respect. I hope you can understand. Please inform me of the business that you had with Mr. DeWitt and I will pass on your details to Mr. DeWitt's secretary Mr. David XXXXX. He will be taking over Mr. DeWitt's affairs until a replacement director is found. I am sorry to give you such bad news. Because of certain security issues, I can't publish the last few exchanges between myself and Martins, however what I can tell you is that eventually he twigged that I had been baiting him. He sent me a couple of threats, and I replied with threats of my own (too unsavoury to publish here!). Needless to say, this particular bait was over by October 28. OK, a few weeks later, and after giving Martins time to cool off, I decided to give him a call. Martins is actually located in London, which is a really cheap telephone call for me. Of course, I did not call him as Marcus DeWitt, I pretended I was some other victim. I didn't have any pre-prepared plan on what I was going to say to him, I just wanted to know how he would react from receiving a call at 2:20 in the morning! Apologies to Irish visitors for the abysmal Irish accent I put on. I didn't want Martins to recognise my voice! As promised, I give Martins a call the next day. Trouble is I was ungracious enough to ring him at 3AM this time! This time I decided to see if he would notice me deliberately slipping into a US and a slightly deep south US accent! I really need lots of practice with my voices I'm afraid. I'll probably stick to British ones, and perhaps try a Prince Charles one soon! Anyway, Martins got frustrated with me and put the phone down. I called him again and chucked a few 4X words at him, which I have edited out so as not to cause too much offence to anyone! See if you can spot where they were! The third and final time I rang him back it sounded like he picked up the phone and put it under his pillow. Though the recording goes off after a few minutes, I did hang on for another ten minutes or so, whistling down the phone! Looks like it's game over. Feeling sorry for Martins? DON'T! Martins makes a career out of stealing money from people on a daily basis. Like most other scammers he has absolutely no compassion or feelings of guilt, and more than likely he would cut your throat for a few dollars if you were ever foolish enough to bump into him on his own turf. Martins can be thankful that all he lost was £400, this is mere pocket change compared to the many many thousands of pounds he steals every year from innocent victims. The money taken from Martins has already been given to a local deserving charity - I never keep money scammed from scammers. Tempted to try baiting scammers out of cash yourself? Please don't. I would advise anyone considering "cash baiting" to think again. Not only is it extremely dangerous for inexperienced scambaiters to try, but legally you are also skating on very thin ice. Whilst morally you may think you are giving the scammers exactly what they deserve, technically you are still obtaining money by false pretences, and whilst you may just get a slap on the wrist from law enforcement officials, the greater danger is from the scammers themselves. It is stressed on this site a lot, but again, PLEASE remember that these people have been known to beat, torture, and in some cases even murder their victims. Although most of the scammers you may read about here seem to be bumbling fools, you certainly would not want to meet up with them in person. You may feel you are safe baiting a scammer many thousands of miles away from you in another country, but remember, even though they themselves may not be prepared to go to the time and expense of flying across continents to come and deal with you, they may well have relatives or contacts living much closer to home! I implore newcomers to scambaiting to never lose sight of the main goal; to waste the scammer's time as much as possible, to mess with their minds, to make them jump through hoops. Of all my most favourite scambaits, not a single one of them involved extracting cash - or even a trophy picture - from the scammer. It is much more satisfying to drive a scammer mentally insane over a period of weeks or months than it is to spend a week or so convincing them to send you a bit of cash. Please do not send requests to me asking how to receive money from scammers. I no longer attempt any kind of cash baiting myself. I tested the waters to see if it could be achieved, now I'm looking for bigger and better ways to get these guys. Any emails requesting information on cash baiting will NOT receive a reply. Of course I cannot force you not to try cash baiting yourselves, but for the sake of your own security PLEASE don't do it!